I think this is great project on so many levels… using a cell phone camera to snap a quick shot in the restaurant means less futzing before diving into your food… you can worry about making a beautiful photo later. It’s also a great way to learn to make the dish yourself, something I always mentally note when I’m eating out but then forget somewhere along the way. 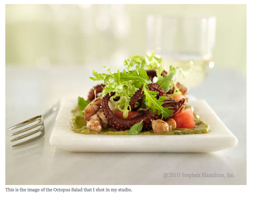 Finally, it’s a great reminder that lighting and styling plays an enormous role in great food photography! It’s really helpful when you use the new diptych format when you post your results! If you are new to the monthly photo challenges, head over to the Flickr group for the rules and to introduce yourself. This challenge will run through the end of September. 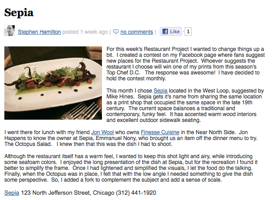 *If you do decide to create a styled photo from a blog snapshot, consider sharing it back with the original author. I’m sure there are many bloggers out there that would love a beautiful shot to accompany their post, but don’t have the time, equipment, etc. to take it themselves. This entry was posted in Photography Challenges and Critiques, Still Life With. Bookmark the permalink. Stopped by SLW to see what’s new and was so surprised to see the Sepia shot as an example for the remake! We were all very happy with the final image, too. Thanks for the compliment to both photography and styling.